Liberty's Kids episode number 35, James Armistead. 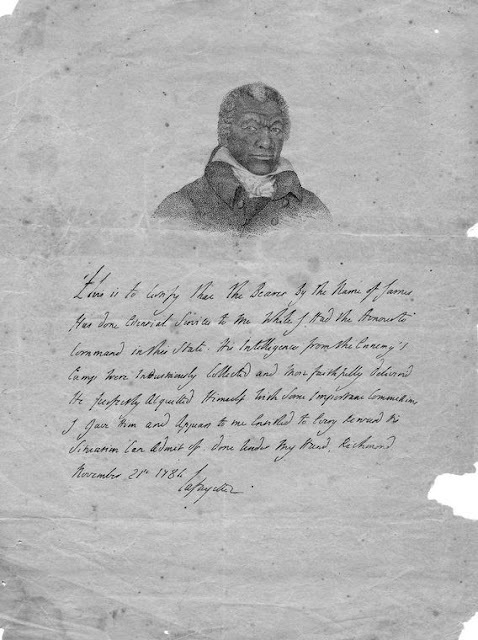 The first double agent spy of the American Revolution under the command of General Lafayette. After getting consent of his master, he volunteered in 1781 to join the army under General Lafayette. He was stationed as a spy. First he spied on Brigadier General Benedict Arnold (by this time, Arnold had defected from the American Continental Army to lead British forces). After Arnold departed north in the spring of 1781, James went to the camp of Lord Cornwallis. He relayed much information about the British plans for troop deployment and about their arms. The intelligence reports from his espionage were instrumental in helping to defeat the British during the Battle of Yorktown. While pretending to be a British spy, Armistead gained the confidence of General Benedict Arnold and General Cornwallis. Arnold was so convinced of Armistead's pose as a runaway slave that he used him to guide British troops through local roads. Armistead often traveled between camps, spying on British officers, who spoke openly about their strategies in front of him. Armistead documented this information in written reports, delivered them to other American spies, and then returned to General Cornwallis's camp. Although Virginia passed a manumission act in 1782 allowing for the freedom of any slave by his or her owner, James remained the property of William Armistead. (A 1783 law targeted specifically at freeing slaves whose owners had used them as substitutes for army service in exchange for their liberty did not apply to James). However, in 1786, with the support of William Armistead (then a member of the House of Delegates) and carrying a 1784 testimonial of his service from the Marquis de Lafayette, James petitioned the Virginia Assembly for his freedom. (The facsimile of the letter of commendation can be viewed on the Lafayette College website.). On January 9, 1787, the Virginia Assembly granted James' petition. At that time he chose to add "Armistead" and "Lafayette" to his name, to honor the general. He continued to live in New Kent County with his new wife, one son and several other children. He became a farmer and at one point owned three slaves.By 1818 he applied to the state legislature for financial aid. He was granted $60 for present relief and $40 annual pension for his services in the Revolutionary War.